What Is Aged Aquarium Water? It has recently been reported that aged aquarium water is essential. What is aged aquarium water, and how does an aquarium hobbyist get it? To put it simply, aged aquarium water is water that has been allowed to sit and "age" for at least 24 hours prior to use. Anyone can age their own water. The bigger question is whether using aged water is preferable to using chemically treated water. There are pros and cons to each. Why Use Aged Aquarium Water? At one time early in the aquarium hobby, the standard was to use aged water. At that time, department stores and chain pet shops did not exist. Often an LFS (local fish shop) was a fair distance away and was only open for limited hours. Therefore it wasn't always quick or convenient to get chemicals to treat tap water before use in an aquarium. On the other hand, aged water cost nothing but the time it took to let it stand. Therefore it was a popular alternative to chemically treating tap water to remove chlorine or other treatments used by local water treatment facilities. Virtually everyone had buckets or tanks of water sitting around that were being aged. Another advantage of aged water is that the water chemistry is allowed to stabilize. Water delivered to a tap is under pressure, and therefore contains dissolved gases, in particular, CO2. A significant amount of dissolved CO2 will temporarily lower the pH of the water. After standing for a period of time, the pH will rise, sometimes significantly. The change will vary based on the amount of dissolved CO2. Regardless of how small, changes in pH are stressful for fish. If the change is extreme enough, it can be lethal. Allowing water to age so it reaches a more stable pH, has advantages for the health of your fish. Is Chemically Aged Water Better? With the advent of department stores that carry basic aquarium supplies and are open 24 hours a day, it has become easier to obtain chemical water treatments. It is even possible to order aquarium products, such as water treatments, via the Internet and have them delivered to your door. Furthermore, most new aquarium packages come with a small bottle of water treatment. As a result, the trend has moved away from using aged aquarium water most of the time, and now owners now use chemically treated water most of the time. Does that mean using chemicals to "age" water is better? Not necessarily. Chemical treatments have two primary advantages. They render water safe for use almost immediately, which is a huge improvement on the one to two days to wait for aged water. The other advantage is that chemicals can neutralize heavy metals and other dissolved constituents that the aging process cannot touch. This is particularly important in areas where water sources have a high mineral content. Most chemical treatments also include a component, such as stress coat, that soothes the skin of the fish. By aging water, the dissolved gases have time to be driven off, and the water temperature can also be stabilized to the desired range. The use of a chemical treatment ensures that any heavy metals or other harmful chemicals are neutralized. The added benefit of the stress coat is a great side benefit of using a chemical treatment. The negative is that it takes time to age the water, while still incurring the additional cost of a chemical treatment. There are two ways to age water. One is to place water in a clean bucket or water jug (with the cap off) and allow it to sit for several days. This method takes a bit longer but doesn't require any additional equipment. It's often used to age smaller quantities of water, either for a small tank or for topping off a larger tank. The downside of this method is the smaller quantity of water that can be aged this way. It also doesn't allow for adjusting the water temperature to the desired range. However, because most homes are relatively warm, this is usually not a problem if the water is only being used to top off a larger tank. Another method to age water is in an aquarium. It may be the aquarium that will have fish added later or simply an extra tank used solely for the purpose of aging water. There are several advantages to aging water in this fashion. First, it allows a larger volume of water to be aged. It also speeds up the process, as a filter, powerhead, or other means to agitate the water can be employed. Vigorously aerating the water more rapidly drives off dissolved gases, as well as chlorine. What would take three days in a water jug, can be accomplished overnight in a tank with heavy aeration. 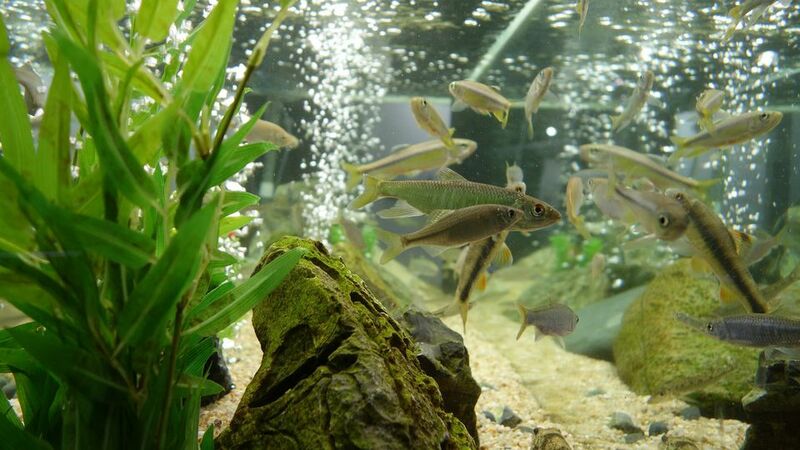 The other big advantage of using an aquarium to age water is that a heater can be used, thus allowing the water to be heated to the desired temperature. By stabilizing the pH and temperature, the aquarium owner can minimize stress to the fish. When setting up a new aquarium, I strongly recommend aging the water in the tank for at least one day or more. Use a water treatment, and you have the best of both worlds. But remember, aging the water doesn't start the nitrogen cycle. That won't kick in until you add fish to the tank. How Important Is Your Aquarium's pH Level? Chlorine vs. Chloramine: What's in Your Water?